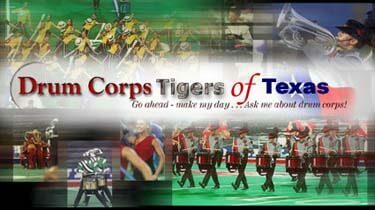 The Drum Corps Tigers of Texas is comprised of drum corps fans who love drum corps, many of whom have never had the honor and privilege of participating with a corps. In fact, they love drum cops so much, they formed a nonprofit organization years ago specifically to support the amazing musicians who participate in the activity. This year, the Drum Corps Tigers are hosting their 12th annual Drum Corps BBQ Bash, a big party/fundraiser that everyone is invited to. Live performances by several drum corps from Texas will be just some the entertainment for the crowd on Saturday, May 6, from 11 a.m. to 2 p.m. in Houston. The event includes a huge barbeque lunch, big-screen viewings of drum corps competitions and dozens of prizes. Special guest appearances will be made by the Cavaliers' corps director Jeff Fiedler, and Phantom Regiment director Pat Seidling, who will be on hand to celebrate the Regiment's 50th anniversary. Proceeds from the event go to help Texas youths who are participating in Drum Corps International performing groups.